Introverts are people who primarily look inward, paying close attention to their thoughts and emotions. It’s not that they are incapable of paying attention to what is going on around them; it’s just that their inner world is much more stimulating and rewarding to them. “I’ve been reading an interesting book which describes the different neurochemistry of Introverts (25% of population) and Extraverts (75%), and explains many of the different traits and needs exhibited by both. It;’s been shown on PET scans that Is use different neural pathways to Es when engaged in almost any type of activity (including relaxation). During one study a group of identified Es and Is were asked to lie down and relax, and a PET scan was used to measure blood flow to the brain and the pathways it followed. The Is had *more* bloodflow to the brain during relaxation than Es, indicating more internal stimulation. Also, the Is and Es’ blood travelled along different pathways – the I pathway was found to be more complex, and flowed to areas of the brain associated with remembering, problem solving and planning. The Es blood flowed on a more direct route to areas of the brain where sensory processing occurs. This confirmed the researchers’ suspicion that the Es in the study were focused on what was happening around them in the lab, and were engaged in sensory processing. 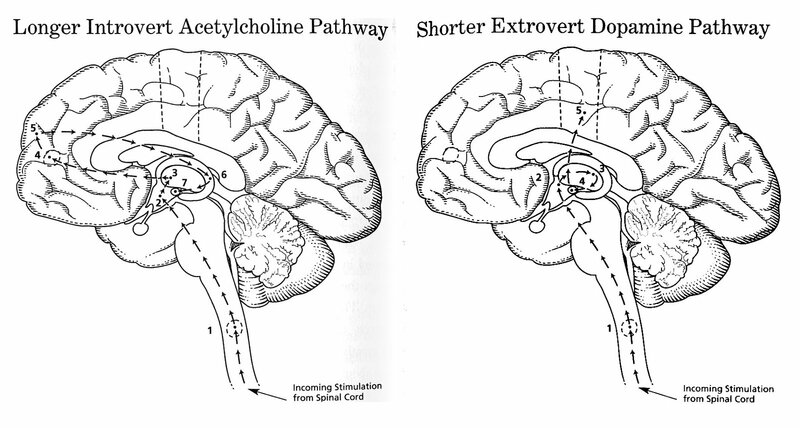 The pathway used by Extraverts is activated by the chemical Dopamine. Dopamine is a powerful neurotransmitter, most closely associated with movement, attention, alert states, and learning. Too much dopamine in the brain causes hallucinations and paranoia, and too little causes depression, lethargy and misery. Having the right amount of Dopamine is critical to everyone. It has been found that Extraverts have a low sensitivity to Dopamine (require more to get the desired effect). They require Adrenaline, which is released from the sympathetic nervous system, and makes more Dopamine in the brain. This explains why Es need more stimulation/thrill/activity, to feel good, and why they seek variety. Introverts are highly sensitive to Dopamine – too much of it and they can feel overstimulated. Is rely on a different neurotransmitter, acetylcholine, on their dominant neural pathway. Acetylcholine affects attention and learning, influences the ability to sustain a calm, alert feeling and to utilise long term memory stores, and stimulates a good feeling when thinking or feeling emotion. Introverts require a lower level of Dopamine, and a good level of acetylcholine, to leave them calm and free of depression or anxiety. Too much activity/stimulation can leave Is in Dopamine “overload”, and give them a feeling of exhaustion. Stimulation ascends the spinal cord and enter reticular activating system in brain stem – data enters the Hypothalamus (thirst/temperature/appetite) – this switches on the “Full Throttle” system in Extraverts – Stimulii are sent to POSTERIOR THALAMUS (a relay station which amplifies the stimuli and sends them to amygdala) – Amygdala is the emotional centre (associated with the actions in the motor area, in extraverts) – Stimuli transferred to Temporal and moror area (movement connects to short term memory access, and to the center for learning and processing sensory and emotional stimuli). This entry was posted in Borderline Truths and tagged Brain, Extravert, Fact, Introvert, Myth, Neuro. Bookmark the permalink. Reblogged this on Au Matu.